Color palettes so often can make or break a wedding design, and rarely do we see bride's take on one simple color for an entire wedding. 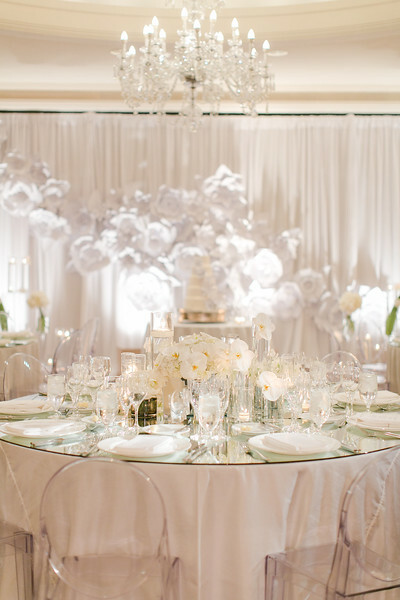 Rene's classic and timeless white on white wedding was a dream to design and execute. The Monarch Lawn at the Ritz Carlton Laguna Niguel is quite breathtaking on its own, so Renee's decision to go with a simplistic ceremony design was a wise one. 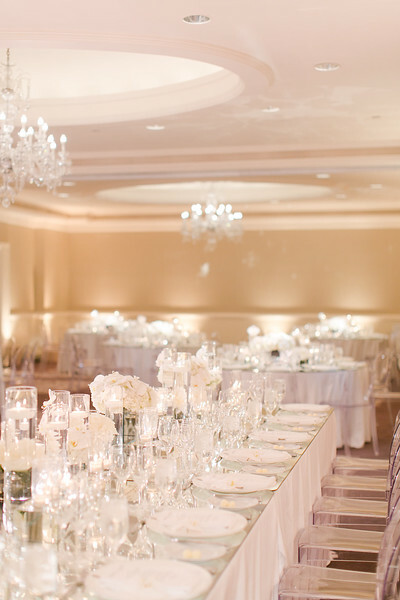 For this wedding, depth and texture became our main priority. We created the gorgeous bridal bouquet using a collection of phalenopsis blooms nestled atop a lush bed of white hydrangea. 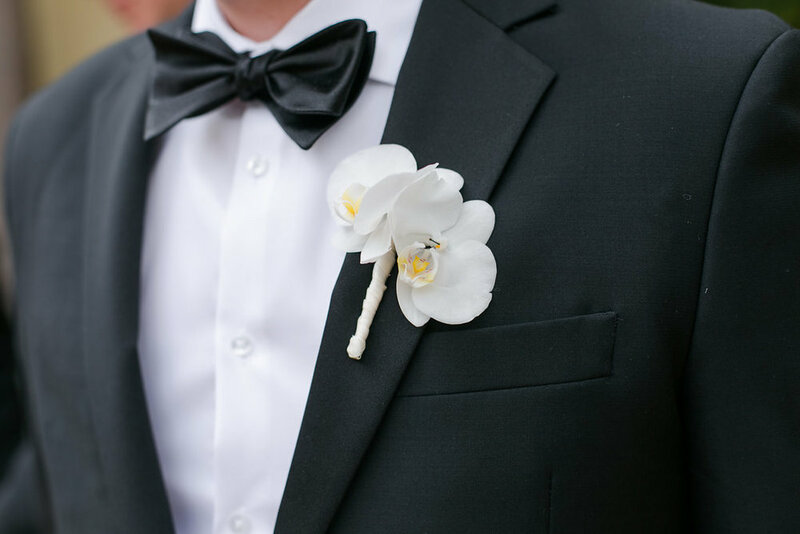 The orchids delicately cascaded down from the bouquet to add more drama to the design. The arrangement was then finished with an ecru colored satin wrap. 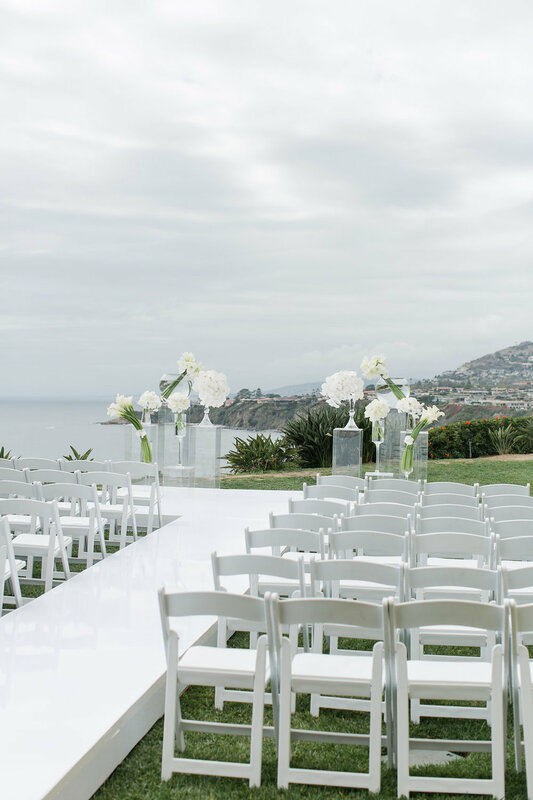 The ceremony took place on the Monarch Lawn at the stunning Ritz Carlton Laguna Niguel. A custom made walk way over 25 feet in length led to a high gloss white stage. To add more height differentiation, we flanked the sides of the stage with a collection of clear acrylic columns. 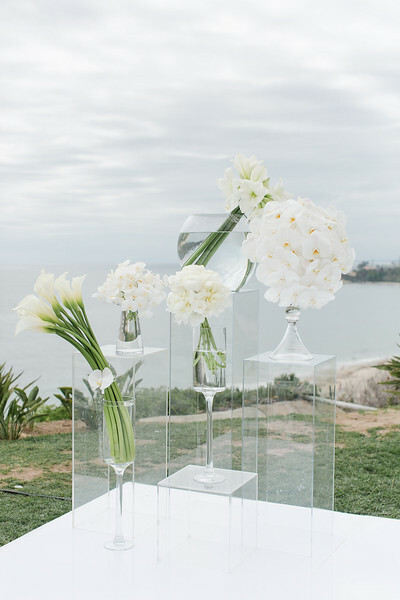 We chose some of our most stylish glass vases to hold modern white hand ties of phaleonopsis orchids, white amaryllis, and stunning white calla lilies. 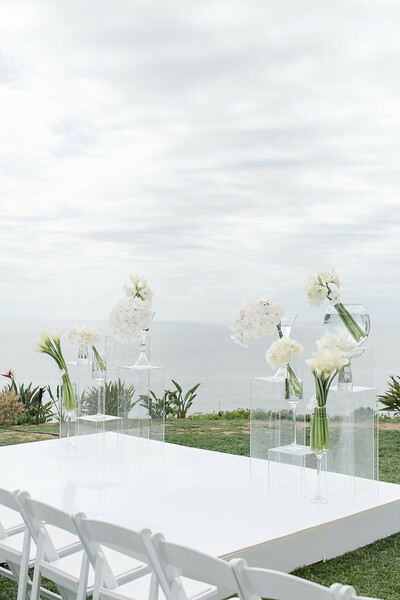 Eight foot long tables featured a low design with tons of clear glass cylinders, mirrored votives, and glass tea light candles. Some of our favorite smoke glass containers sat intermingled with the candles with modern collections of all white florals. It was very important to Renee that the table designs remained all under eye level, which can sometimes get in the way of dinner conversations (definitely something to keep in mind when planning your event!) Our beautiful focal point was made up of dozens of hand made white paper flowers cascading down from the left to the right side of the ballroom.